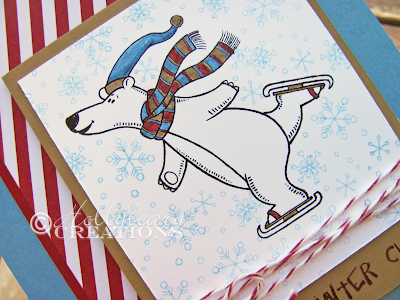 Hollybeary Creations : 'Tis the Season with a little MoJo! 'Tis the Season with a little MoJo! Sorry for my lack of posting lately.. It's been crazy around here and I've been driving all over for appts for my kids. We live so far out in the middle of nowhere it's usually a 12 hour or more trip to take one of them to the doctor's office. By the time I get home I need to de-stress and I'm tired. We have one more left for this year and then I'm free until January... Whooo Hooo. We'll, that is unless someone gets sick.. so fingers crossed that doesn't happen. 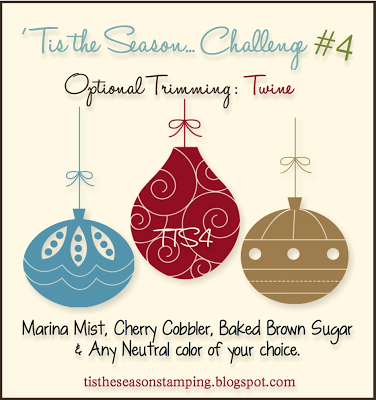 I've been playing catch up this past week.. and There is still time to play along with us at 'Tis the Season Christmas Challenge. We are on a Color Challenge Bi-Week with an Option of Twine. The Linky will close on Tuesday Nov. 26th so you have time to join in the fun still. I used some Stamping Contraband.. Sssshhh Don't tell anyone! But when I saw this stamp set I had to have it! It's called Polar Bear Holiday from CTMH. These Polar Bears are adorable. I started with the sketch from MoJo Monday, there challenge is open until Sunday Nov. 24th. 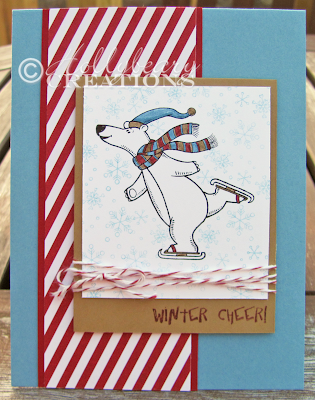 My card base is Marina Mist with a layer of Cherry Cobbler and some Season of Style DSP. Then I stamped the image onto some Whisper White and matted it with Brown Sugar. I added some Cherry Cobbler Baker's Twine and stamped the sentiment along the lower edge of the Bakes Brown Sugar in Cherry Cobbler. I added some Marina Mist Snowflakes around the image and then colored in it with my Markers. Head over to the 'Tis the Season Blog and see what the rest of the Design Team created.. we hope you will join us! I'll be back later with another post, Thanks for stopping by! That polar bear is adorable Holly, I love him! You colored him beautifully with the challenge colors.